Harvest House Publishers, 9780736961295, 352pp. Lovina Miller should be thrilled. Pinecraft, Florida, has everything a young Amish woman could ask for: sun, sand, volleyball games, and evening singings in the park. 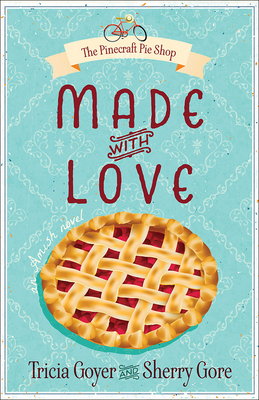 But Pinecraft lacks the one thing Lovina desperately wants--a pie shop of her own. She longs for a place to gather with the community and serve the treat she loves. A young carpenter named Noah Yoder strolls into her life and offers a way to make her dream come true. But before Noah and Lovina can build a shop--and a life--together, they must each face heartaches from the past. Is their new love stronger than their regrets? Tricia Goyer is a busy mom of ten, grandmother of two, and wife to John. A USA Today bestselling author, Tricia has published over 60 books and has written more than 500 articles. She's well-known for her Big Sky and Seven Brides for Seven Bachelors Amish series. For more information visit Tricia at www.TriciaGoyer.com. Tricia, along with a group of friends, also runs www.NotQuiteAmishLiving.com, sharing ideas about simplifying life.Sherry Gore is the author of Simply Delicious Amish Cooking and Me, Myself and Pie and is a weekly scribe for the Budget, a nationwide Amish newspaper. Sherry's culinary adventures have been seen on NBC Daytime, Today.com, and Mr. Food Test Kitchen. Sherry is a resident of Sarasota, Florida, the vacation paradise of the Plain People. She has three children and is a member of a Beachy Amish Mennonite church.